Augmented Reality application to present product's specificities. During about 4 months we had to work in collaboration with a start-up from Nantes, E-Cobot, which designed a Cobot (collaborative robot) called "Husky". They intended to promote their product on professional exhibitions, and our goal was to help them do so by creating an experience for the prospects and visitors. As a starter we focused on the product itself. How does it works ? What are its specificities ? What is really relevant to present to a prospect ? What constraints will we have to face on a presentation stand ? We decided to work with Augmented Reality technologies based on the constraints of space on exhibition's stands. Then we find out that taking an omniscient point of view would be more relevant, to demonstrate the positive effects of Husky on a working environment. In parallels with also designed the stand itself. Now our application is based on narratives. The visitor can activate them to see a distinct specificity of Husky. Based on a white model with simple shapes to add any skin you want, the AR gives life to it. 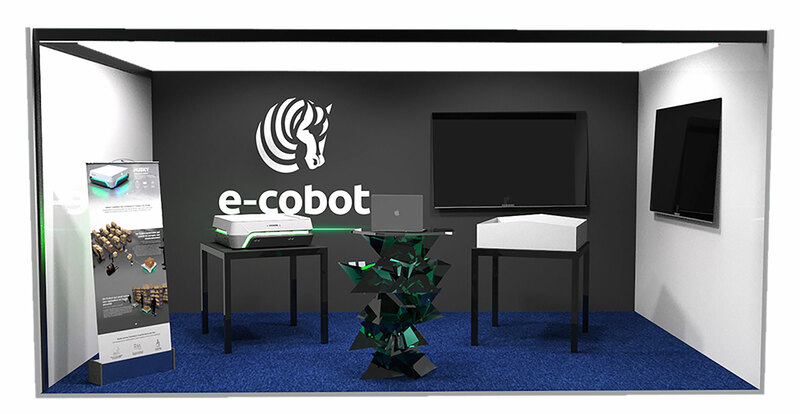 The app can also work just with a tracker, allowing E-Cobot's team to use it on meetings and not just for exhibitions. This project is now on production and will be used by E-Cobot on the 2019's Laval Virtual exhibition.